Potatoes combined with the dairy section of your supermarket. That is the heaven known as Mormon Funeral Potatoes. A faith-based culture surrounding food has evolved from Mormon kitchens. Living in Las Vegas, (which, if you didn’t know has an enormous Mormon population), for a few years and not knowing anyone there I was invited to many Mormon family meals. The dishes were always the same fare, some of which I make often. However, none are more renowned, beloved or iconic than Mormon Funeral Potatoes. Caring for one’s home and family is a role that is paramount for the Mormon wife. Homemaking classes are held at their wards where women are taught various skills such as crafting or cooking, while getting a chance to socialize and have fun. Recipes are passed on at church gatherings, family dinners, Mormon cook books and relief society newsletters. Like any funeral food the dish freezes well, travels easily and is comforting. No one knows exactly when the dish’s name had “funeral” permanently affixed to it, (although, I’m working on researching that), but, perhaps this is why in recent decades it is expected fare at Mormon funerals – arguably required, as one woman learned when she tried to cater a Mormon funeral sans the cheese laden potato dish. I recently received a message from friend, Sarah Wambold, a funeral director and embalmer who is also a member of The Order of the Good Death. Sarah was going to be partaking in a fried food contest among friends and wanted to know if I knew of any funeral foods that were fried. 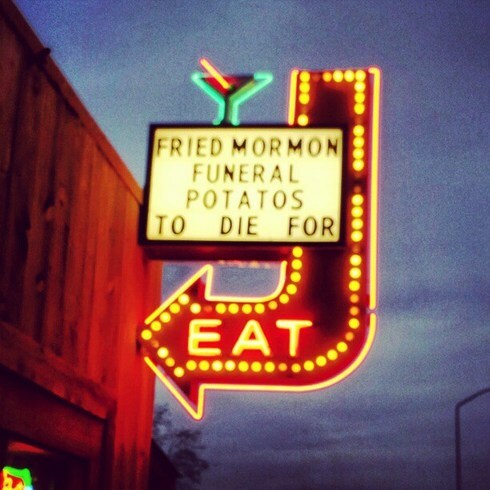 I didn’t – however, after seeing this photo of a neon sign outside a Utah restaurant funeral potatoes were the first thing that came to mind. I decided to modernize the recipe a bit, throw bacon in, (because BACON), and hoped for the best as I didn’t have time to test the recipe out for myself. In the end, Sarah WON the fried food showdown with these! FUNERAL FOOD FOR THE WIN. Here is the recipe along with bonus ingredients of weird food history and commentary. Thanks so much to Sarah for inspiring these. So, depending on how many people you are going to have to serve, you might want to double the recipe. Bacon is included, but you can leave that out for those who are veg or do a batch with and one without. 4 – 6 slices of bacon (or more if you want) – cooked and made into bits, pieces, whatevs. 1 1/2 cups shredded/hash brown potatoes – so, can can get potatoes and do it yourself or you can go to the freezer section at the store and get a bag of them ready to go, which is fine since it’s THE MORMON WAY. If you do that, defrost them before hand and if needs be soak up any moisture left by patting them with a paper towel. 1 cup corn flake crumbs (you can make these by putting the cornflakes in a food processor or blender. Ranch dressing for dipping these things into, if so desired. 1) Add bacon, onion, cream cheese, jalepenos and sour cream together in a food processor or you can use a stand mixer with a flat beater if you have that, or you know, go primitive with your hands and a spoon. Mix those things until well blended, a minute or so should do it. 2) Stir in the hash brown potatoes, cheddar, flour, cornstarch, parsley, salt, eggs, and 3 Tbsp. of the corn flake crumbs into the cream cheese/bacon mixture. 3) Put some parchment/wax paper, foil, whatever you have, on a baking sheet. Scoop out enough of the mixture to form into a ball – meatball size – roll it into a ball. Roll the ball in the cornflake crumbs to coat (the balls should firm up once they are coated). When you are done, put the ball on the baking sheet and repeat until they are all done. Put them in the fridge for awhile to chill – this will help them keep their form once you start frying them – 30 min should be plenty. 4) Fry a few at a time until golden brownish. Drain on paper towels. Enjoy. Sarah’s notes: They were deep fried in peanut oil, if that matters and people were suggesting dipping them in things like sriracha and hot sauce, which does sound delish.